G.M. International new PSx1200 Series power supplies have been designed to provide the greatest levels of availability and safety for high integrity and critical applications. Three independent over voltage protections: 1 voltage limiting loop at 30 Vdc and 1+1 crowbars at 30 Vdc. 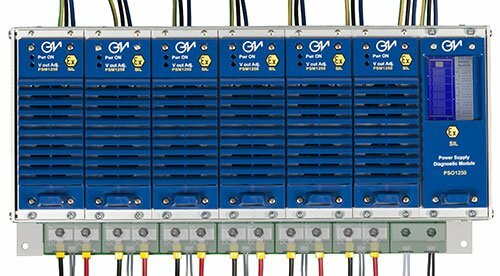 Under and over voltage alarm monitoring. High load fuses breaking capacity to ensure that, in case one load attached to the power supply fails, others are not affected. Units are SIL2/SIL3 according to IEC61508:2010 Ed. 2. Designed for installation in Zone 2 / Div. 2 hazardous locations. Up to 1200 W for a single unit. Up to 3600 W (fully redundant) for 19″ rack system. Better than 89% efficiency with 0.98 Power Factor Correction. Fully redundant options available with load sharing. Two universal AC input lines. Wall, DIN-Rail, 9″ or 19″ rack mounting versions. Modular systems for wide range of applications. Active Ideal Diode circuitry for lower internal power dissipation and greater efficiency.